I grew up on Vancouver Island. For those of you who don’t know where that is, it’s on the west coast of Canada (that giant land mass to the north, Americans). It’s one of the most beautiful places I’ve ever seen – even through eyes jaded with a lifetime of looking at it, there are parts of Vancouver Island that leave me speechless. Ragged mountains push their way up from the horizon on clear days, their old granite shoulders capped in snow with a blue-sky crown. Everything is green and wet, the air is clear and the water is clean. Massive, creaking forests seem nearly endless, muffling most of society’s clamor in just a few steps. The ocean is a bigger part of life to Vancouver Islanders than most – nearly everything and everyone on the Island depends on it, either for sustenance or pleasure. It’s a wonderful place. There is a tight-knit surfing community on the southern end of the Island, one much less recognized than Tofino’s mid-island beach breaks and hidden slabs. For years it was, for the most part, a community made up of tradesmen; blue-collar workers with calloused hands and quiet demeanors, people there for the simple act of riding waves instead of the lifestyle that is marketed with it. In recent years, that lifestyle has mixed with surf marketer’s crystal blue, swaying palm lifestyle. It has formed an odd hybrid of toques, thick flannel, thicker neoprene and brands founded with more tropical climates in mind. But there are a few throwbacks to how Vancouver Island’s surfing culture would be had the mainstream not ever found it. Chet Frost lives in a small town surrounded by towering cedars just over an hour north of the southern-most point of the island. Nanaimo is a port town, with most of its residents tied closely to the sea. He’s a cut and dried woodworker; a master carpenter, cabinetmaker, and furniture maker. Working with wood for 42 years will teach a man a thing or two about tricks of the trade, and Chet has sawdust in his heart. 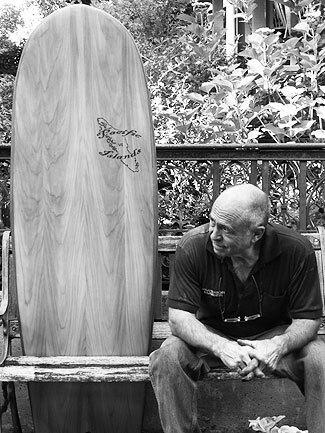 He also makes surfboards – and not just any surfboards. He’s building masterpieces. Tom Blake-esque, beautifully crafted pieces of art, created from only reclaimed wood, glassed with a plant-based epoxy. You could grind these boards up and throw them in your garden, and your tomatoes would thank you. Chet made me one. Specifically, he made me something called the Roundo, a weird, flat thing with a squaretail and nose as wide as a bridge. When I pulled it out of its protective bubble wrap, I was conflicted. It is far too pretty to surf. It looks like something that should be hanging above a large stone fireplace, the centerpiece of a warm, comfortable room that smells of brandy and wood smoke. The first time I took it out, it felt weird. It felt like I was surfing on a piece of wood – which, I suppose, I was. The board I ordered is not a performance board, by any means. It’s 6’1 x 22.25” x 3”. I ride it as a single fin, because I feel as though boards like this shouldn’t be ridden any other way, but there is room to make it a thruster. It’s a bit heavier than a foam board, as is expected, but surprisingly, not that much heavier. The boards only run about six or eight ounces more than foam, and once you get them in the water, they’re much more buoyant. It catches waves with about the same ease as a 9’6 that I ride frequently, and though it’s difficult to pump on because of its thick rails and little bit of extra weight, its down the line speed is faster than anything I’ve experienced on a board like that. It’s an interesting feeling that, I suspect, has something to do with its weight. Almost juggernaut-ish, it slowly gains speed and momentum, using its own weight to increase speed down the line. When it comes to turning, it’s just as one would expect, really. The Roundo isn’t built for aggression, but instead excels when put into long, flowing lines punctuated by wide, wrapping turns. My general feeling about Chet’s boards (and more specifically, the board he built for me) is that it is a perfect substitute for a longboard. On days where the waves are a little slopey and slow, the Roundo has become my go-to board. And if it’s performance you’re after, Pacific Islands has that covered, too. But no matter how well his boards work, the real sticking point is that, in a market flooded by companies building poisonous products for a community that loves the environment, Chet’s surfboards are not only beautiful but among the greenest, earth friendly surfboards in the world. And there’s just something satisfying about knowing the board beneath your feet isn’t made from something that kills the life beneath the board.